Flautist Alessandra Rombolà’s rendition of Christina Kubisch‘s 1974 Emergency Solos – a work the composer described during the festival as her “goodbye to instrumental music” – was one of the most agonisingly authentic performances i can remember. 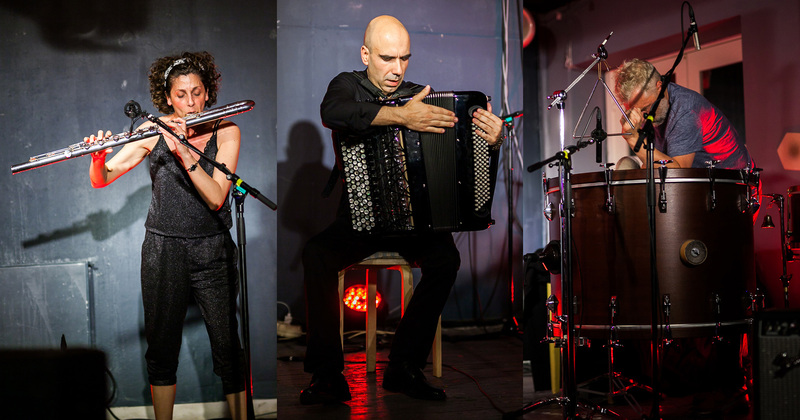 Kubisch reflects on the stumbling blocks, barriers and expectations that confronted her as a woman musician at the time by inflicting ever more hindrances on the flautist: thimbles on all the fingertips, causing regular jams on the keys; playing on just the headjoint with a condom placed over the end – subsequently used as a bladder to elicit groaning squeaks; stuffing the instrument into a gas mask, resulting in increasingly desperate in- and exhalations, the flute buzzing and producing strained blurts of pitch before finally dying; forced to put down the instrument in order to adopt a defensive posture behind boxing gloves; and attempting to play ‘Silent Night’ while wearing mittens. The coup de grâce of the final solo was almost unbearable to watch, Rombolà playing the solo part from (if memory serves) the first movement of Mozart’s Flute Concerto in D while being systematically taped to the chair. 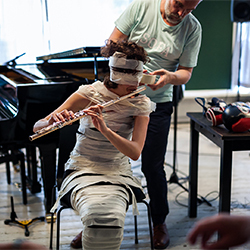 Obviously, as her legs and torso were secured there was minimal impact on the music, but as her arms and head were covered in tape the melody grew more and more indistinct, until the final piece of tape covered her mouth, silencing the music, the instrument and Rombolà herself for good. It was a brave, horrifyingly brilliant performance that provoked a great deal of discussion in its aftermath. These pieces haven’t been heard since Kubisch performed them herself in the 1970s, so hopefully they’ll now have a new lease of life, particularly as their message remains relevant. asamisimasa returned to perform three works by Simon Løffler. Having experienced b and H at last year’s HCMF, my hopes weren’t particularly high, and while they once again seemed aurally empty compared to their visual/physical elements, in the wake of Kubisch’s Emergency Solos it was hard not to experience b as an extreme example of the demands to which composers habitually make on performers, here rendering asamisimasa into something akin to a trio of robots. 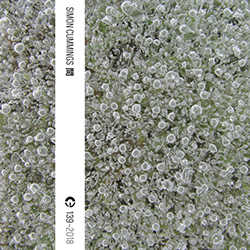 a was new to me; composed with non-musicians in mind, the soft intimacy of its playful conversation between a glockenspiel, a toy piano and a small synth was completely charming and in a way hard to articulate, rather affecting. This was followed by a series of pieces played in the nightclub space by Alpaca Ensemble, all of which had been composed via a workshop process and most of which seemed to need some additional spit and polish (having said that, one of the composers confided that only a portion of their piece was being performed due to time constraints, so one wonders about the extent to which the rest of the programme adequately reflected the composers’ intentions). 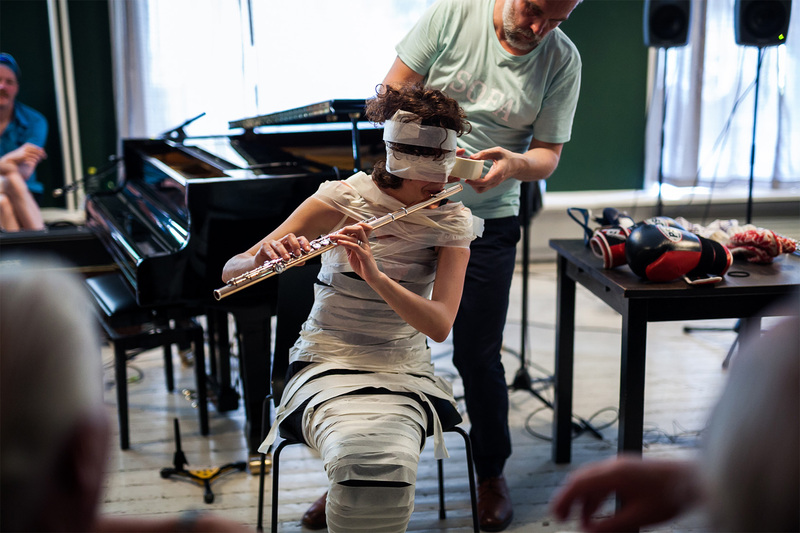 While none of them made a particularly strong impression, the one work that stood out – perhaps more for dramatic than musical reasons – was Tine Surel Lange‘s No Visual, where the ensemble was blindfolded (it was a tough day for performers in Oslo!) and wielded various wine glasses and bowls of water, creating a delicately fragile sonic world. Initially somewhat superficial, it later developed a demonstrative, vigorous character that made a strong impression. 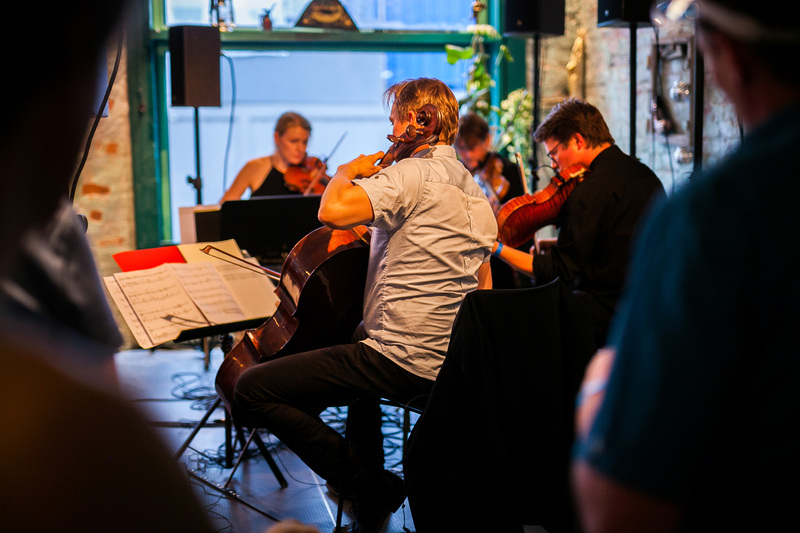 Being back in the bar didn’t at first seem the most promising place to be hearing Georg Friedrich Haas‘ String Quartet No. 2, even more so considering that i was (by choice) reclining in an armchair unable easily to see the Cikada String Quartet. Yet this focusing entirely on the aural dimension of the piece proved to be incredibly involving. In particular, the way Haas practically superglues the four players together so that their movements become the actions of a singular behaviour was executed with such stunning fidelity that at one point i felt compelled to leap out of the chair almost to prove to myself that there were, in fact, four separate people on the stage. Following along the work’s strange, drifting journey through episodes of intense activity and near-stillness was mesmerising, turned into something majestic at its conclusion, the quartet’s combined texture floating but robust, with something distinctly transcendent about it. Their subsequent performance of Mauro Lanza‘s The 1987 Max Headroom Broadcast Incident, its title referring to one of the weirdest and most notorious instances of broadcast piracy, was equally hypnotic in the way its convoluted relationship developed. 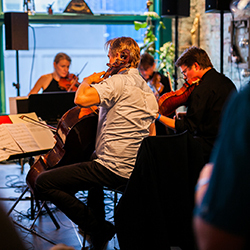 Imposed clicks initially disrupting the quartet’s material very gradually – almost imperceptibly – took over completely, such that the distinction between acoustic and electronic sounds was essentially gone. Again, i was out of my seat, trying to disentangle with my eyes what my ears couldn’t handle. Moving across to a smaller space in Skippergata designated the ‘Lab’, pianist Heloisa Amaral returned to give the world première of Marina Rosenfeld‘s Piano and Work (dominos) for piano and electronics. 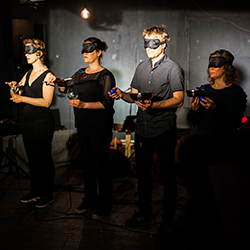 In some respects the piece brought to mind Martin Stig Andersen’s sound design for the game Limbo, an unsettling, otherworldly, monochrome electronic palette caked in crackle and hiss, with oblique vocal sounds reverberating as if from within a metallic space. Amaral teased out pitches from this world on the piano (both via the keyboard and directly on the strings) before the work transitioned into a more percussive environment in which the piano and electronics now seemed to be in combat with each other. In due course the music transitioned again, nicely blurring the electroacoustic relationship so that at times they seemed unrelated to each other, at others like they were a duet. Ultimately the work seemed to clarify that the two elements were integral to each other, complementary even, though the hierarchy between them was far from clear. An attractive and engagingly ambiguous piece. It’s good to go out on a high, and the final concert i experienced at Only Connect 2018 was an essay in pure elation. 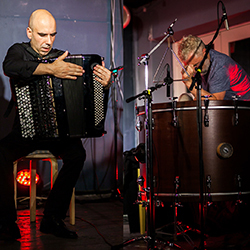 Given by improvising trio O3 – comprising accordionist Esteban Algora, flautist Alessandra Rombolà and percussionist Ingar Zach – it seemed at first as though the journey they intended to take us on would be relatively straightforward. Zach elicited deep drones from his bass drum, over which skittering surface details were added from the flute and accordion. In itself this development was exquisitely handled and beautiful to behold, but it transpired that this was merely an overture of sorts, part of a broader slow-build of enormous intensity. The drones were blown apart and instead O3 focused on a complex network of filigree elements, continually pumped full of energy by Zach. 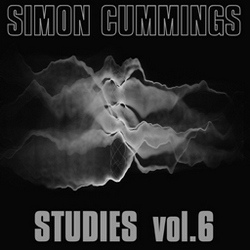 During one sequence it was as if we were no longer in Skippergata’s nightclub but caught in a wind tunnel – though with the wind filtered out, leaving only blasted and distorted shapes – and later, in an amazing lengthy episode, as if we had plunged deep inside a human body, the music underpinned by an incessant heartbeat. Ecstasy isn’t all pixie dust, rainbows and unicorns, it’s found in complex, bewildering, overwhelmingly gorgeous stuff like this, that in the best possible way diminishes us in the face of its glory. There was nothing else to do but simply give in to it. 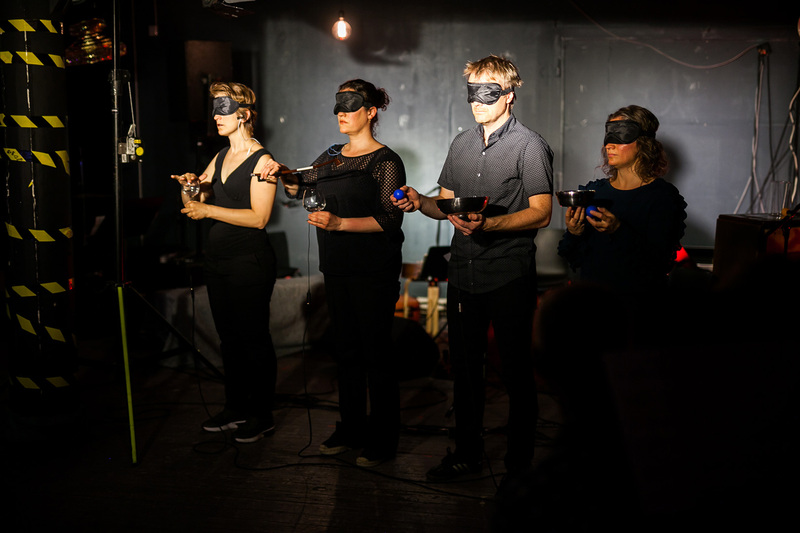 Only Connect, as its name implies, is a festival deeply concerned with connections, and taken as a whole the 2018 festival entirely lived up to that name, bringing together aural and visual elements, setting up disparate collaborations, placing performers and audiences in unexpected and unfamiliar situations. This didn’t merely provoke a questioning of the nature of the connections and what they might mean, but above all highlighted that whether we recognise it or not, and whether deliberately, accidentally or just by juxtaposition or inference, all of these aspects are connected anyway. No musical experience takes place in a vacuum – it’s such an obvious thing to say, yet so marvellous to explore and contemplate the ramifications of that truth.